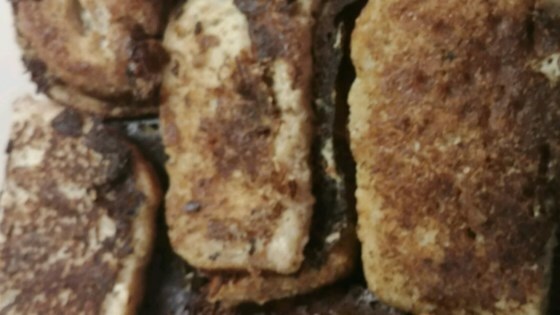 "Vegan French toast recipe I created, because I just have yet to find 'the one'. This one is really good. Serve with vegan butter." Mix boiling water and ground flax seeds together in a bowl; let sit until thickened, about 10 minutes. Combine flax mixture, soy milk, tofu, and nutritional yeast in a blender; blend on high speed until flax has almost disappeared. Add cornstarch while blender is still running and blend until batter is smooth. Pour batter into a bowl and refrigerate until chilled, about 30 minutes. Pour some of the batter into a shallow bowl or plate. Dip bread, 1 slice at a time, into the batter until evenly coated. Heat oil in a skillet over medium-high heat. Cook each dipped bread slice in the hot oil for 5 minutes; flip and cook the other side until lightly browned, 1 to 2 minutes more. You can skip the oil if using a nonstick skillet or griddle. If you do not have vanilla soy milk, add a tablespoon of sugar and a teaspoon of vanilla extract to plain soy milk. Nutritional yeast can be found in most health food stores. If you are short on time, the flax does not have to be chilled; just cool it a bit before adding to the blender. I did not press any water out of my tofu.